I have just come back from my French trip - to cool temperatures, overcast skies, and fitful rain. I sallied forth yesterday to buy croissants and whole milk in a bid to recreate the holiday experience, but nice as the croissants were, they couldn't cut the mustard - or rather the homemade vat of confiture with which my friend L presented me on the first morning of my stay. I guess a sense of anticlimax is inevitable after such a lotus-eating idyll, which is pretty much what it was, give or take the lotus-eating. And you may be surprised to learn that there was a big fat, astonishing perfume episode bang in the middle of the trip, which warrants its own post in Part 2, while all the other scented aspects of my visit - of which there was a surprising smattering - will be covered 'en passant' in this post. Quite literally, indeed, for in a general chat about perfume, L's neighbour C happened to remark that she liked the smell of lilac, so I commended 'En Passant' to her in passing. On the day of departure, I had to get up very early, and managed to squirt tinted moisturiser all down my clean T-shirt before 6.15am. 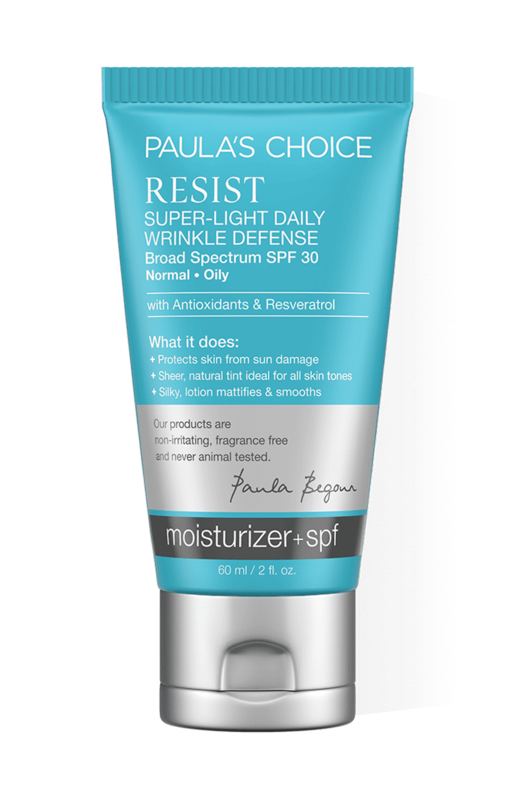 It's that Paula's Choice Resist Super-Light Daily Wrinkle Defense cream (sic). I would add that it is 'super-prone to geyser-esque eruptions' at the merest flick of a lid, and urge extreme caution when using it. Manchester airport was absolutely heaving...the sort of crowds where you'd stand up to peer at the departure board for two seconds, only to turn round and find someone in your seat. Also worthy of mention is how the airport - or certainly Terminal 1 - has a disorientatingly elastic sense of time. The gate was due to open 'in 5 minutes' for what must have been all of half an hour. As my plane was also delayed, I had ample time to browse in the Duty Free, but only took a moment to respray my scent of the journey, Hermes Eau des Merveilles, and tuned out to everything else, including the gigantic Toblerone ingots, which were three for a tenner, and should really have been reclassified as an offensive weapon on the joint grounds of weight and pointiness. I am pleased to report that my knitting needles were not construed as an offensive weapon on this trip. I decided not to attempt to hide them, but rather waved them ostentatiously at security staff. I think the added verisimilitude of my mentioning I was hoping to knit an entire flannel whilst on holiday might have swung things in my favour. As we walked towards the car park pay station, I noticed that L had surprisingly strong sillage of a perfume I couldn't quite place. It occurred to me that if it was a favourite scent, she might have become anosmic to it and started to apply more and more in a bid to smell it on herself. Later, I tentatively inquired what the perfume was: it turned out not to be one of L's staples, but the remains of a bottle of Issey Miyake that was a cast off from a friend, and which she was trying to finish up, as she wasn't sure she cared for it all that much. Well, I was glad to learn that, and it immediately explained the sillage issue. Issey Miyake may be the 'poster child' for the inoffensive and supposedly anti-perfume trend of the 90s, but it has a monster melon note - a 'monster melon that has freshly exited a shower cubicle', as I am sure I have said somewhere on the blog, but don't ask me where. On arrival in my friend's village, her ceramicist friend S, with whom we made the excursion to the Bernaudaud Foundation the previous year, popped round with some flowers from her garden for my bedroom. She herself left a discreet trail of La Vie est Belle, which continues to be her signature scent, while the bouquet itself included several sprigs of sage. These had a fabulously pungent aroma - unlike anything I had ever smelt in a Schwartz jar, which is pretty much my acquaintance with the herb up to this point. Oh, also in Paxo Sage & Onion stuffing mix, obviously. We met up with S and her husband for al fresco coffee the next morning, and I kept stopping in my tracks as I caught whiffs of sage in different spots in their garden. So if walnuts were the plant leitmotiv of last year's holiday in the Limousin, sage was shaping up to be the vegetal theme this time round! 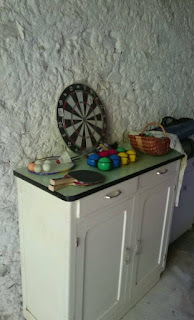 Later that morning, after sponging the jam stains I had incurred at breakfast on both trouser legs - silly spillages were to be another theme of the holiday - L invited me to join her in clearing out her fireplace, something she had omitted to do in the two years she has owned the house. Game for anything, I followed her upstairs to the sitting room and we carefully lowered the glass door protecting the grate to reveal...drum roll!...a carved metal salamander! Well, we weren't initially sure it was a salamander, but a question on Facebook quickly elicited the confirmation we were after. 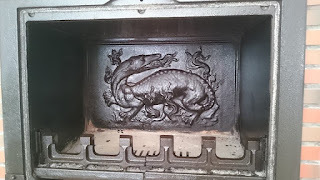 I also learnt from a post on the blog 'Writing the Renaissance' that these mythical beasts were a common embellishment on the fireplaces of royal palaces, no less, while the chateau at Chambord has over 800 different kinds of salamander carved into the ceiling of the main hall. "Salamanders appear not only on buildings, but on many royal possessions. Salamanders were tooled into the leather covers of books bound for the royal library. 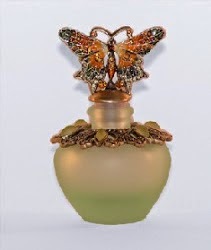 A perfume-burner designed by Raphael for the king had salamanders and fleurs-de-lis on the lid." Thrilled by this discovery in her humble townhouse, L pressed me into service with a brush and a pot of linseed oil. 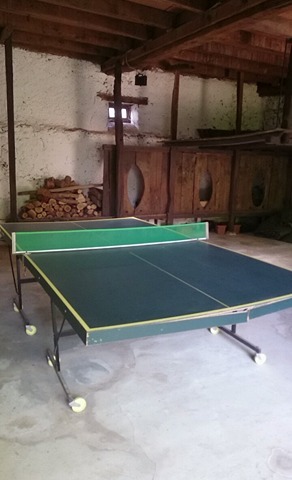 I would never have guessed I'd be spending the start of my holiday oiling a salamander, but there again, I never expected to find a well-appointed table tennis station in my hostess's barn. In the afternoon we went shopping in the village's bijou and compact Carrefour. It may even be called Carrefour Compact, come to that. And speaking of melons, to lighten L's basketload of shopping, I offered to carry a melon in one hand and a bottle of rose wine in the other, and sneaked in a few bicep curls with them on the way home. We ate in the garden that night (as we did every night we were 'in'! 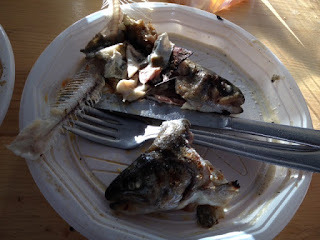 ), and I managed to drop courgette carpaccio, which turns out to be 'a thing', really - a thing dripping in oil unfortunately - on my newly swabbed trousers. We completely forgot to have a game! The next day I had a major crisis on finding I was unable to access my flight booking for the return leg - I thought it wise to download my boarding pass well in advance of my return, you see. Ryanair seemed to have no record of it under the reference code I was given. I ended up spending an hour locked in a live chat session with a Ryanair customer services representative while he endeavoured to get to the bottom of the puzzle. It turns out that I did have a booking, but it was under CW6I7C, not CW617C. And yes, I had to look twice, especially as the 'I' of my booking print out didn't have a serif on the top and bottom of the 'I'. My eye read the booking number like a car registration, where it is customary to have a block of letters, then a few numbers, then maybe a letter again. You would never find a letter smack in the middle of the numerals. I realised afterwards that the only place that would ever happen is in one of those gobbledy-gook passwords that comes with your broadband. And now, Ryanair booking codes...so be warned! The toilet of the cafe where I spilt my tea was noteworthy, mind, for this big bottle of cologne. It is only by Schwarzkopf (Henkel), a brand I associate with haircare products rather than fine fragrance, but I had a sniff as you do, and was amazed at the more than passing resemblance to Guerlain Sous le Vent. A drugstore cologne that is clearly punching above its price bracket. That night we ate out with friends of L at a local produce market in a nearby village. The idea was to buy food and drink from the stalls that lined the square - well, more of a rectangle, really - then take your meal and eat it at the long trestle tables placed in the centre. The women in our party all had trout and chips. It never ceases to amuse me that VAT in French means 'vidé avec tête' - 'gutted with head'. The following day was L's birthday, and I was up betimes on a quest to hunt and gather breakfast ingredients, after first changing my T-shirt due to yet another tinted moisturiser incident. First stop was the boulangerie. I asked the boulanger for his 'most medieval' bread, as L had mentioned that she liked one that was made according to a 'centuries old' recipe. He looked a little askance initially, but after scoping the fixtures with professional care, settled on a rye cob. I got a couple of croissants with that, and though I quite forgot to ask for 'epitome-shaped' ones, he instinctively knew to proffer his most perfectly puffed up and crescent-shaped specimens, so that was a bit of luck. The fruit tarts had not yet been put out on display, but the boulanger helpfully went out back and fetched them for me, and with that I had the 'morning goods' side of things covered. Next up was Carrefour, to procure the wherewithal to make Bucks Fizz. Cue more weight training on the way back with two bottles of sparkling wine. And because of my wish to retire to the area myself one day, I couldn't help but home in on any little old ladies sitting outside particularly photogenic houses along the route, and surreptitiously try to gauge their likely life expectancy. L was very pleased with my choice of loaf, which she declared to be 'commensurate with my great age'. I will leave the account of the rest of L's birthday till Part 2, as it was on that day that the big unexpected perfume episode occurred! In my excitement, I may have slightly hijacked her festivities in the process, but she was most gracious about it, certainly. Does this bread look ancient to you? Then the day after L's birthday we made an excursion to the hilltop town of Turenne, which boasted a fine selection of échaugettes, complete with inverted walnut whip terminations (see below). The steep ascent to the castle proved excellent for the calves and challenging for the lungs, and we were not sorry it was cooler that day. On the way down, we both made impulse purchases of mugs - two in my case! - even though my kitchen cupboards are already bulging with a 40-strong collection. But sometimes impulse purchases just have to be made, and the one I managed to bring with me on the plane has been in constant use. That night, there was a street fair in L's village, and we joined some friends and neighbours of hers, including the aforementioned lover of lilac, C. I quizzed C about her taste in perfume, being totally floored by what she was wearing on the night (I am invariably floored by what anyone is wearing, to be fair). It turns out C is pretty much a Sisley loyalist, wearing the new Izia in summer - which I had never smelt before - and Eau du Soir in winter. We discussed our respective stances on Eau de Sisley 1, 2 and 3 (neither of us were big fans), and lamented the ubiquity of certain scents that shall remain nameless, but which may contain 'Mademoiselle' in the name. There is a parfumerie in L's village, would you believe, that doubles up as an ironmonger's and a toy shop - of course it does. Or it did, rather. Today there is a only a rather forlorn collie in the window, who may or may not be officially guarding the deserted premises. 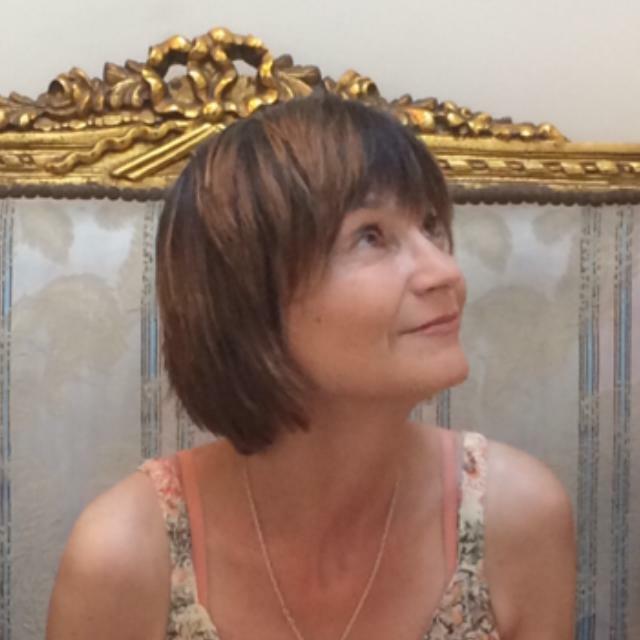 Coming up in Part 2 - the extraordinary perfume related episode! I do hope I am not overselling this, haha. Lovely to hear from you, and sorry I couldn't meander past your neck of the woods on this trip. What an amazing titbit about that Mont St Michel perfume - I should have just googled it, hehe! They have done a good copy of recreating the old formula, certainly. Am intrigued to know what the other ones in the range are now, and will ask my friend to look out for them! I don't usually spill things so frequently, but something came over me on this trip. I hadn't been back half an hour when the cat - in an access of affection - knocked over a full cup of tea on the stair carpet with her tail. I am still cleaning that, but the carpet needs chucking anyway, really. The cat, too, eh? Are you sure it was not her "subtle" way of letting you know that that's what you get for leaving her all by her lonesome while you are living it up abroad? No indeed - I am certain she was caught up in the moment and being very loving and demonstrative, and that it was just an ill-judged swish of the tail. I have used another type of carpet cleaner on the stain now - yes, I am the sort of woman who has a variety of remedies to hand, for obvious reasons! 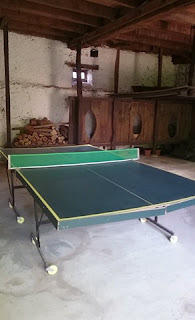 - and I think it looks a bit better now. Maybe even more so when it is hoovered. But ultimately I would like to expose the stairs and put a runner, though I guess fitted carpet is more practical all things considered. We'll see. That was bad luck about stabbing yourself! Absolutely not my type of a holiday but it was fun reading about it in your interpretation. I wonder: what were you eating with that wonderful bread during your breakfast? Nothing on the picture suggests that you needed bread - but maybe something is left out from that picture? I recently realized that I actually like the fact that people are wearing perfumes - any perfumes (unless we have to spend long time in closed quarters), so it's quite easy to please me, even if I wouldn't want to wear that perfume myself. That's interesting about it not being your kind of holiday...insufficiently beachy? Or cultural? Or urban? Or populated with restaurants? Though there were lots of lovely villages and churches to explore - and craft shops, so the visit was by no means without retail opportunities. I agree that I get a lift when I walk past someone wearing perfume - any perfume, as you say, barring real monsters of some kind. I prefer either big cities or a warm beach. I'm soooo not a rural-quiet-serene-vacation type person! I was more or less on the right lines with your holiday preferences then! My bad for missing the bread question - I mean I did clock it first time round, but forgot to address it in my comment. Everything needed for the bread is in the picture, I would have thought...butter and several kinds of jam. That is a complete breakfast right there. The croissants and tarts were a birthday bonus. We did eat croissants AND bread, and had the tarts the next day as afternoon tea. You would think that with all our years of eating and drinking experience, we wouldn't be spilling things on ourselves. Alas, I spill all the time. It usually happens when traveling, and I have fewer clean clothes available. Anyway, welcome home. 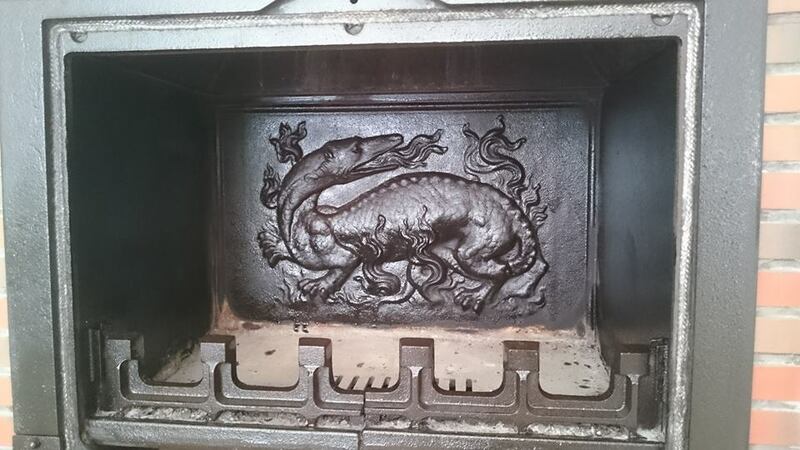 It was lovely to catch-up on the first part of your trip, V.
I was thrown when you said salamanders were mythical but it turns out that although they are real lizards, there were myths about them being able to withstand fire - hence the gorgeous fire plate! Sorry, that is a good point you make about salamanders - which are certainly real creatures, minus the fire breathing trick! That sounds like a wonderful holiday, France has such a lot of good food and places of interest. I used to love the buttery biscuits from Brittany, for example. At the same time I can very well understand the need for a more substantial bread than the traditional baguette. Had to smile seeing the mention of postcards. You know I love postcards, but seriously, I'm certain I have sent at least one multiple view-type postcard for you depicting buildings in Ålesund. Oh well, the selection isn't always great, my friends tend to share pictures instead of writing postcards. I love those buttery biscuits from Brittany very much too, indeed I asked L to custom purchase some for me and bring them back in her car so they don't get squashed.